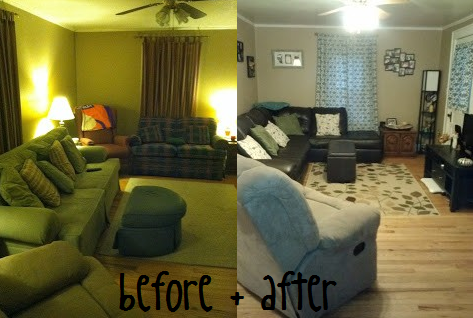 this is my favorite room in our house & i think that's because it's the room that underwent the biggest transformation! Thomas had some very gracious people in his life that gave him a lot of free furniture, so the living room before had a lot of furniture that didn't match. it was kept up nice, but there weren't any colors that "popped" or anything on the walls which made the room just feel "blah". as a wedding gift, my parents gave us some money towards a couch & we found an awesome sectional for a great deal! we ended up getting the couch months before we got married because we couldn't pass the deal up! as you can see, we also got some artwork & picture frames to hang on the walls which makes the room feel less empty. we got new curtains & new rugs off our registry that changed the entire color scheme of the room & we love it! it feels like the room is so much brighter now! we did also get two new lamps for our wedding, so that may help with the brightness factor! 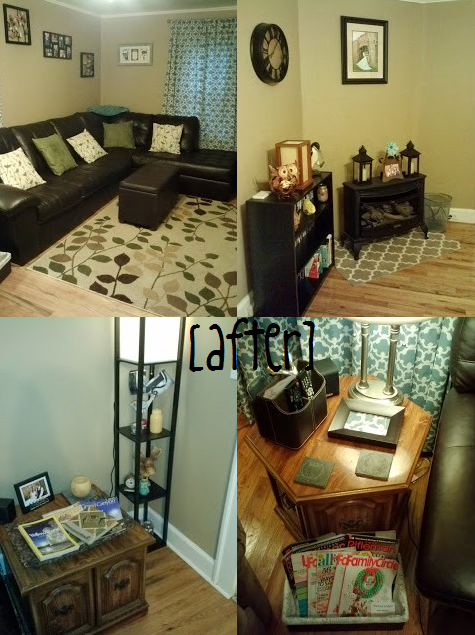 we also found a great deal on two matching end tables which we have purchased since these photos were taken. also, our reclaimed window coffee table sits where that ottoman is now. my after pictures didn't catch the back corner of the room, so here's a before & after of just that section. this picture was taken before i added our wedding shadowbox on the wall behind the chair. 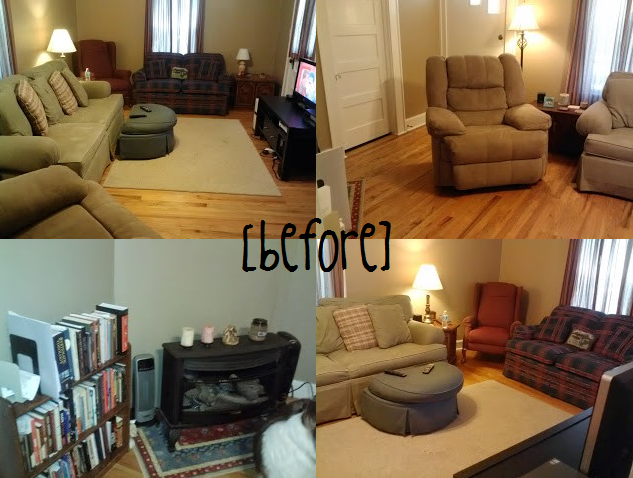 and because i love before & after pictures so much, here's a recap of the entire room! in this picture, the room is literally brighter in the after picture! this is also another good before & after point - before i moved in Thomas never used the overhead light! he lit the room only by lamps. it drove me crazy when i would come over & have homework to do. my eyes just don't like no overhead light. Thomas, on the other hand, hates overhead lights and would prefer if the entire house was lit by lamp light. of course, we keep the overhead light off for the most part and especially when we're watching a movie, but when we're working on something that overhead light is on! do you have any colors that pop in your living room? which do you prefer: overhead light or lamps? My sis and I just had a discussion about decorating, and she told me she fell into the trap of buying too many neutrals! Your after pictures look so much better--I'll be keeping that rule in mind for my future decorating. Your new room is so pretty! I prefer over head and lamps; meaning I like tons of light all the time. However, my husband has blue eyes and all the lights give him a headache so we usually opt for lamps at night. I love it! I somehow acquired a great deal of yellow things so I just kinda went with it. I never LOVED yellow, but love the extra brightness it brings to my neutral color scheme. My grandmother had those octagon tables!!! how cool!!!! lamps! Totally. We call the overhead light the "sun" and we never turn the "sun on." It's too harsh! Love it! It looks really great and way brighter! Nothing makes a place homier than good light right? And, I love the new rug, and the couch! It's looks comfy, and it's leather right, the BEST! Fun! I love before and afters! I totally prefer lamps! Although we didn't have much of a choice. Our apartment doesn't have any overhead lights. I love how cozy lamps make everything feel. I really like the patterned rug and curtains, and your new couch is very pretty! ha! i love that - the "sun"! funny you should say that because i have blue eyes too and they are definitely sensitive to the light - but for some reason they are sensitive to not enough light too! wow! crazy!!! :) they are such good quality!! it really does!!! and it FEELS bigger too which is nice! :) thanks Susannah! that's funny!! but you're right, i bet that brings an awesome pop of color!! thanks Beka!! haha i love that you like both on at the same time!! funny you should say that because i have blue eyes too and they are definitely sensitive to the light - but for some reason they are sensitive to not enough light too! thanks Danica! :) you're right! i never thought about how much room it saves too! :) i am definitely pro-overhead lighting!! thanks Amy! :) you're right - all the brightness just warms my heart and makes me feel comfy! our couch is actually fake leather BUT it feels like real leather in that it is very squishy and comfy!! thanks so much Rachel!! :) we ended up with 3 different patterns on the curtains & rugs but i think they look okay together! i hate trying to match up patterns! thanks Caitlin! :) i love love love our living room so much now! those curtains are my favorite!! they came from Target & they have other colors also! I'm totally a lamp person. Always have been. Especially when I was living in the dorm at college and when I got my own place, it was all lamps, all the time! ha. Love the before and after! It looks great! thanks so much Jess!! i love our living room now!